A leader in desktop pc's, printers and servers HP continues to drive product innovation in their core markets, with a focus on cloud, security, and big data. 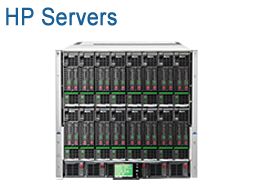 HP ProLiant servers power the web and nearly every aspect of your daily life. 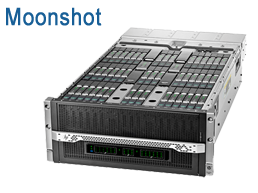 HP ProLiant servers provide a comprehensive portfolio for companies of all sizes, across all industries and for any type of workload. 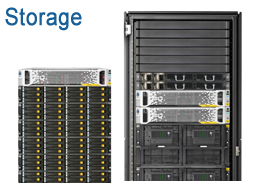 The HP Integrity server portfolio's unparalleled resiliency, availability, and security empower your enterprise business to quickly adapt to changing conditions while maintaining core business processes and customer-facing interactions. HP Rack and Power Infrastructure As your data center grows, power and cooling costs can continually grab an ever larger piece of your IT budget. HP Server Infrastructure Management Take command of your infrastructure across the lifecycle with embedded on-system capabilities, through scalable on-premise management to cloud-based, anytime/anywhere access to health monitoring and warranty/contract tracking. A new class of server. Cloud, Mobility, Security, and Big Data are transforming what the business expects from IT resulting in a “New Style of IT.” The result of alternative thinking from a proven industry leader, HP Moonshot is the world’s first software defined web server that will accelerate innovation while delivering breakthrough efficiency and scale. 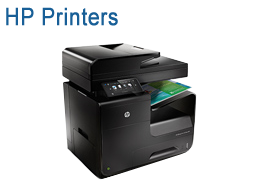 With the HP range of printers you can enjoy the freedom and the ease of being able to print the important documents you need -.straight from the devices you use - wirelessly via your Wi-Fi network with no setup required. HP Business PCs are energy efficient and well equipped to go beyond meeting your daily business demands. Enabled for manageability, you can also choose the productivity and security features that best suit your everyday needs with a PC designed to exceed your expectations. Recover data faster. Not only that, HP StoreOnce eliminates backup window issues with faster backup and scale plus a Get Protected Guarantee to reduce capacity requirements - all at a lower cost per TB/hr. Move to the next era of backup. Paul Santeler, Vice President & GM of Hyperscale at HP, discusses how HP Project Moonshot creates the new style of IT. From the moment you see your first ProLiant Gen8 server to the first time you touch the precise design, you will feel and see the quality built-in. HP's latest desktops keep employees productive and provide Professional Innovations to manage and help protect businesses. 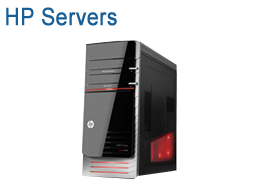 Mike Diehl, Product Marketing Manager, HP, shares the latest regarding HP's Z1 G2 Workstation. Our specialists are expert in designing data center solutions and can help you create a plan for sourcing and deploying your HP solution. Optrics offers personalized HP product training - a service designed to help you integrate your HP solution smoothly into your network infrastructure. "[We] have had the pleasure of working with David Papp and Nicholas Paufler on various occasions... I found [them] through Optrics Engineering while searching the Internet for network monitoring software solutions. "David's troubleshooting skills are phenomenal and... his general knowledge of network design and troubleshooting continues to be extremely useful to our organization."